One of the first maps printed south of the Mason-Dixon Line. A Sketch of the Situation and Stations of the British Vessels under the Command of Sir Peter Parker on the Attack upon Fort Moultrie on Sulivan Island June 28th, 1776. 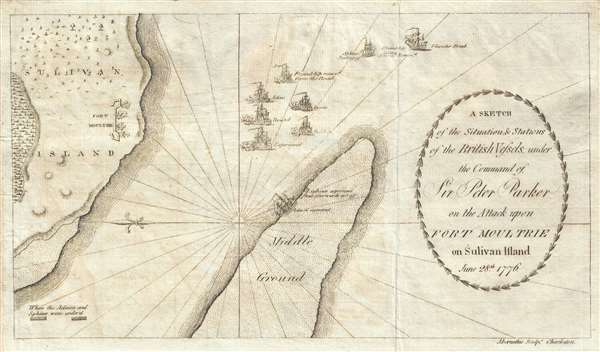 An uncommon 1785 map of Fort Moultrie, at the top of Sullivan's Island, South Carolina, early in the American Revolutionary War. Oriented to the East, this map depicts the entrance to Charleston Harbor and its defenses. The map is intended to illustrate the Battle of Sullivan's Island or the Battle of Fort Sullivan, which was fought on June 28th, 1776. The partially constructed Fort Moultrie is noted, as is some of the swampy terrain on Sullivan Island. Also shows is the deployment of Parker's fleet, and the sand bar, called the Middle Ground, where Parker's ships, the Actaeon and the Sphinx, ran aground. Charleston was a focus of British interest early in the war. As a center of trade and commerce in the southern colonies, the British recognized that a successful capture of Charleston could quickly turn the war in their favor. The British sent 11 warships under the Command of Admiral Sir Peter Parker. Parker was up against a partially constructed fort, then called for Sullivan, under the command of Colonel Moultrie. Due to misjudgment on the part of the British with regard to the terrain and skilled leadership on the part of Moultrie the attack proved a disastrous failure. The British did eventually return to Charleston, and captured it, but not until 1780, when the British had turned their attention to the south after facing heavy losses in the Middle Atlantic colonies. This map was engraved by Thomas Abernethie in Charleston for David Ramsay's History of the American Revolution. It is one of the earliest maps printed in America south of the Mason-Dixon Line. Ramsay's history is the first work to be granted a copyright in the United States and one of the earliest accounts of the events of the American Revolutionary War. Thomas Abernethie (fl. c. 1783 - August 20, 1795) was a Scottish land surveyor, printer, and engraver active in Charleston, South Carolina during the latter part of the 18th century. Abernathie arrived in Charleston during American Revolutionary War, about 1783. As early as 1785 he maintained offices on 105 Broad Street, where he advertised himself as surveyor, a copper-plate engraver, and a printer. He later relocated his offices to 227 Meeting Street (1786) and ultimately 42 Queen Street (1785). In 1786 and 1789 he was contracted to engrave the city of Charleston's paper money. His is also known to have engraved the maps for David Ramsay's 1785 History of the American Revolution. Little else known of Abernathie's life, but his maps are considered the earliest printed in North America south of the Mason-Dixon Line. He died on August 20 of 1795. Ramsay, D., History of the American Revolution, (Philadelphia) 1785. Very good. Light toning and foxing. OCLC 748847663. Nebenzahl, K., A Bibliography of Printed Battle Plans of the American Revolution 1775-1795, 72. Wheat, J.C., and Brun, C. F., Maps and Charts Published in America before 1800; a Bibliography, 596.